Francesca "Franki" Amato is a tough-talking rookie cop in Texas—until a 911 call involving her boyfriend, Vince, and a German female wrestler convinces her that she isn't cut out for a life on the police force. 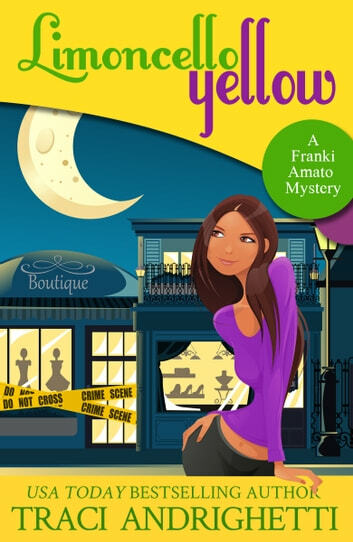 So Franki moves to New Orleans to work at her friend Veronica's detective agency, Private Chicks, Inc. But her hopes for a more stable life are dashed when Private Chicks is hired by the prime suspect in a murder case to find out what really happened to a beautiful young boutique manager who was found strangled with a cheap yellow scarf. When she's not investigating, Franki is hoping to seduce handsome bank executive Bradley Hartmann, but most of her time is spent dodging date offers from a string of "good Italian boys"—make that not-so-good aging Italian men—that her meddlesome Sicilian grandma has recruited as marriage candidates. As Mardi Gras approaches and the mystery of the murdered shop girl gets more complicated, Franki must decipher the odd ramblings of a Voodoo priestess to solve both the murder and the mystery of her own love life. Accidentally rated this 1 star, trying to find a way to fix that. i thought the book was very very good. i love the three main characters. It was very funny. and i couldn't put it down. I can't wait to read the next one. PI, ex-cop, NOLA, stripper, stress buster, humor, no gratuitous erotica, What's not to like? Franki really wanted to be a cop, but her mentor was a sleazebag and her lover seemed to prefer lady wrestlers, so she packed up and left Texas for NOLA and her best friend's PI agency. The smothering Italian family had her phone number, though. The verbal humor is great, but the situational humor is guaranteed to have you snorting your caffeine! The publisher's blurb gives hints, but can't really do justice to things like the eccentric ex-stripper who still dresses for pole dancing, or some of the antics the characters get up to. A fun escape read! I had the ebook, but forgot about it until I got the audio.